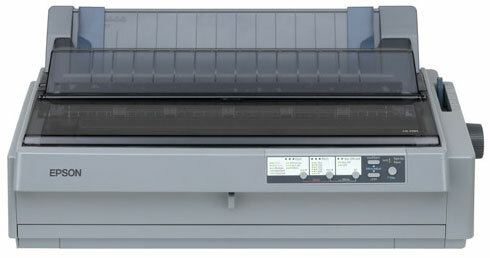 Epson Company has introduced the Epson LQ-2190 — an improved model of the well-known printer Epson LQ-2180. Compared to its predecessor, the new printer has a higher speed and larger print resource, and is equipped with USB interface. Epson LQ-2190 is designed to work in the banking sector, as well as in other industries where you want to print on multicopy media. Due to the high reliability of the printing mechanism, the printer can be used under adverse working conditions — in dusty areas, in production shops, as a part of mobile workstations. Maximum speed of the new printer is 576 characters per second (12 cpi) in HSDraft mode. The ribbon allows you to print up to 8 million characters. The estimated resource of the Epson LQ-2190 printhead is 400 million points per needle. High speed and performance make it the most efficient at work. Installation and use of the Epson LQ-2190 are simple and convenient, thanks to a flexible supply of paper, parallel and USB interfaces. This entry was posted on Tuesday, June 8th, 2010 at 8:18 am	and is filed under Epson, matrix, printer. "HP Introduces First Printers With HP Smart Install Technology"
"New HP Printer Support Printing From iPad and Web Applications"